Myanmar Itinerary 7 Days, Discover The Golden Land in 1-week Tour"
Myanmar itinerary 7 days allows tourists taking a trip back in time to indulge in the overwhelming sight of ancient gilded temples and pagodas and get a taste of the country’s cultural diversity which is made up by more than 135 ethnic groups. One week in Myanmar is enough for you to visit some of the must-see highlights of the country. From Yangon, expect to be overwhelmed and tiny when visiting Chauk Htat Gyi Buddha Temple and marvel at revered 217 foot reclining Buddha. And of course you cannot miss the sight of Shwedagon Pagoda, which is the most iconic religious site of Yangon with a golden chedi that is so tall and blinding, it’s visible throughout the whole city! 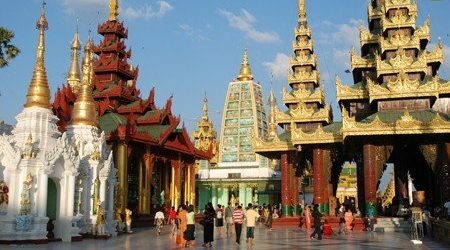 In Mandalay, the cultural and Buddhist center of Myanmar, visit famous pagodas with unique architecture and special religious meaning such as Mahamuni Buddha Pagoda, Kuthodaw Pagoda, the Golden Palace Monastery, and so on. There are numerous sights centered around Mandalay Hill, and sunset over the hill is a thing you don’t want to miss in Myanmar itinerary 7 days. Also, Myanmar itinerary one week drop you on a boat to Bagan to admire the view of the Irrawaddy River while relaxing your muscles and mind on the boats. You can also challenge yourself by climbing up 700 hundred steps to visit Mt. Popa, which has a view so spectacular it’s worth all the effort you make. In order to fulfill the need of travelers all over the world, we operate many Myanmar tourism packages for Myanmar itinerary 7 days. You can contact us for booking, consulting and tailoring a unique Myanmar tour to suit your budget and interests. We want a tour to Myanmar in 7 days in the early of March. Please quote me the price and accommodation for a group of 6 people. Thank you for your interest. Please check your email for the detailed quotation we drop on this Myanmar 7 day tour package and feel free to ask us any questions you may have. When is the best time to take this 7 days Myanmar tour? The best time to visit Myanmar is from November to February. During this time, the weather is cool and perfect for outdoor activities. 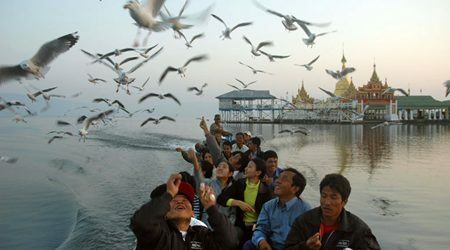 However, this time Myanmar experiences a large number of tourists. If you want to enjoy the best of Myanmar with not too many people, you can still visit it in the low season from April to July. This time is the hot season so remember to bring enough hat, suncream, and sunglasses to protect your body. Hi, I am interested in this package of 7 days in Myanmar. Could you please include me the price, hotel rooms, transportation and other services you may include. I intend to travel in May 2018. We are a group of 5 people would like to travel to Myanmar in 7 days. Please send me a quotation for this package in August 2018. Welcome to Go Myanmar Tour! Please check your email for the detailed quotation we dropped upon your request of 7 days in Myanmar and let us know other questions you may have. is it better to plan the trip Dec 24-30 or Jan1-7 in terms of availabilty and pricing ? Please include all transfers, internal flights only , tours , breakfast . I also want the hot air ballooning over Bagan to be included one morning . Could u please design an itinerary as above and give me pricing WITH and WITHOUT hotels please. Thank you for letting us know about your travel plan. Please check your email for the detailed itinerary for your 7 days in Myanmar tour package and let us know if you have other relevant questions. Interested in this tour, single supplement at 4* accommodations. Travelling in February and if possible, would like to include Golden Rock. Thank you for reaching to us. A detailed quotation upon your request has been sent to your email already. Please check it and let us know if you have other questions. Our scheduled tour will be on 03 January 2019 till 10 January 2019. Please advise me on the full details of the package for 7 days in Myanmar including price, hotels, transportation, additional expenses, etc. Welcome to Go Myanmar Tours. A detailed quotation for the package 7 days in Myanmar has been sent to your email already. Please check it and let us know other questions you may have. Our children are between 14 and 17 years old. Does this itinerary for 7 days in Myanmar suit them? Thank you for reaching to us. Our itinerary for 7 days in Myanmar is suited to children much cause it does not require hard activities. There is only a hiking route to the top of Mount Popa with 777 steps but your children can definitely do it. Hi, I’m Jack from England. How much for this Myanmar tour 7 days in June 2019 for 3 people? Please quote me the accommodation as well. I look forward to hearing from you. Thank you for reaching to us. We have dropped a detailed quotation on this 7 day Myanmar tour package to your email already. Please check us and let us know if you have other questions. Exploring Myanmar is truly an experience of a lifetime since this peculiar yet phenomenal country never ceases to amaze visitors and locals alike. If you are still wondering about where should you visit in Myanmar itinerary 7 days, just have a look at this list below. Yangon is always the gateway city to almost trips to Myanmar. In Myanmar itinerary 7 days, you have a chance to visit Chaukhtatgyi Buddha Temple, which houses the giant 217 foot reclining Buddha. In here, the sense of scale is overwhelming and it’s totally common for you to feel tiny and in awe standing in front of the giant Buddha – an incredible work of man. 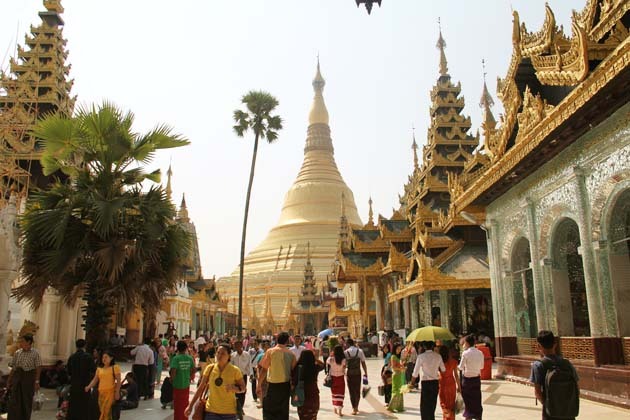 Shwedagon Pagoda is also a must-visit in Myanmar itinerary 7 days while you’re in Yangon for the dazzling beauty it possesses and its place as one the most iconic religious sites in Myanmar. In the evening, you can stroll along the street of China town and treat yourself with not only the exotic and mouth-watering taste of food but also the vibrant atmosphere of the city itself. Kandawgyi Park is the next popular destination to visit in Myanmar itinerary 7 days. It is blessed with a calming and peaceful atmosphere, making it the perfect place for people to relax and take beautiful photos of the mirror-like Kandawgy Lake or the magnificent Karaweik Palace. 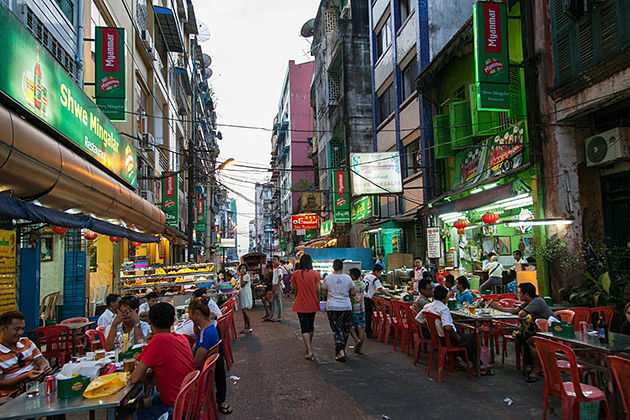 Located in the center of Downtown Yangon, China town is an exciting place to visit in Myanmar itinerary 7 days, especially at night when the whole street transforms into a colorful night market. In China town, getting a taste of exotic food has never been easier since you’re surrounded by the steaming-hot dishes in the food stalls and various kinds of delicious tropical fruits. Mandalay is the cultural and Buddhist center of Myanmar with a great number of temples and pagodas; each has a distinct meaning and architecture. And Myanmar itinerary one week will lead you to the Mahamuni pagoda to admire the image of Buddha, which is giant and covered with a thick layer of gold leaves. The Shwenandaw Monastery is also a famous destination to visit in Myanmar itinerary 7 days for its teak wood carvings of ancient Buddhist myths. Mandalay Hill is one of the must-visit destinations in Myanmar itinerary 7 days for a splendid view at sunset. You will find walking up 1729 steps of stair totally worth it once the view reveals itself. Plus, you get to exercise and enjoy the sight of monasteries and temples along the way to the top since there are numerous of them centered around Mandalay Hill. Bagan is a great place to explore in Myanmar itinerary 7 days with over 2000 pagodas and temples, stunning scenery and signature local handicrafts such as lacquerware and bamboo works. You can explore Bagan by many means of transport, whether it is by bike, by car or by horses and carriage. The most exciting and novel way of all, however, is taking a hot-air balloon ride in this city of pagodas as the sun rises from the horizon. Myanmar itinerary 7 days to Bagan also gives you a chance to shopping for local handicrafts such as lacquerware or bamboo works. If you want a little bit of challenge Myanmar tour 7 days, climbing up 700 hundred steps to visit Mt. Popa is something to consider as the view is beyond spectacular. An excursion on Inle Lake in Myanmar itinerary 7 days is an ideal way to enjoy the peaceful and stunning nature of Myanmar. You can take a closer look at local fishermen working as well as appreciate the view of lotus silk weaving and floating tomatoes farm etc. We offer a variety of Myanmar itinerary 7 days to meet your requirements, whether it is a classic tour, adventure tour, exploration tour or a honeymoon tour. 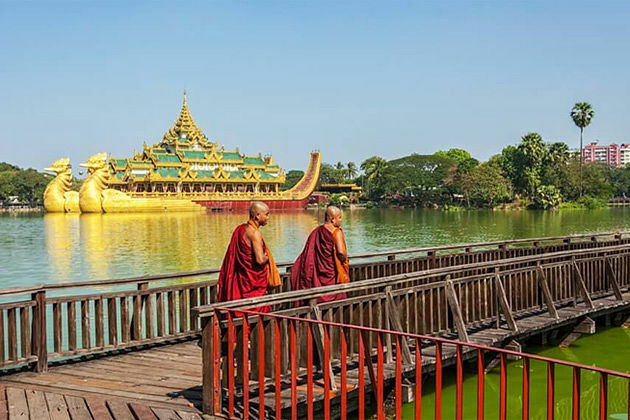 The recommended itinerary for a week in Myanmar is Yangon – Bagan – Inle Lake – Yangon. Visiting other destinations is possible, but keep in mind that you may have to rush from one place to another because of limited time. You can also customize your own ideal Myanmar tours by contacting us.